Cambodia’s economic growth over the last ten years has been among the fastest and most consistent in Southeast Asia, recording an average GDP growth of 7 per cent per year since 2010. In 2015, this rate dropped very slightly to 6.9 per cent. With 2.5 million of the country’s total population of 15.4 million living in the capital, Phnom Penh, it is not surprising that the country’s capital and economic hub is driving dramatic growth in the Cambodian property market. In fact, in 2015 Cambodia was second only to Laos PDR in Southeast Asia for the fastest rate of urban spatial extension, according to the World Bank. One of the key secrets of Cambodia’s economic growth has been creating an attractive environment for foreign investment, and this remains a key driver today. In 2015 foreign direct investment (FDI) in Cambodia topped US$4 billion, while the country’s permanent expat population exceeds 78,000. 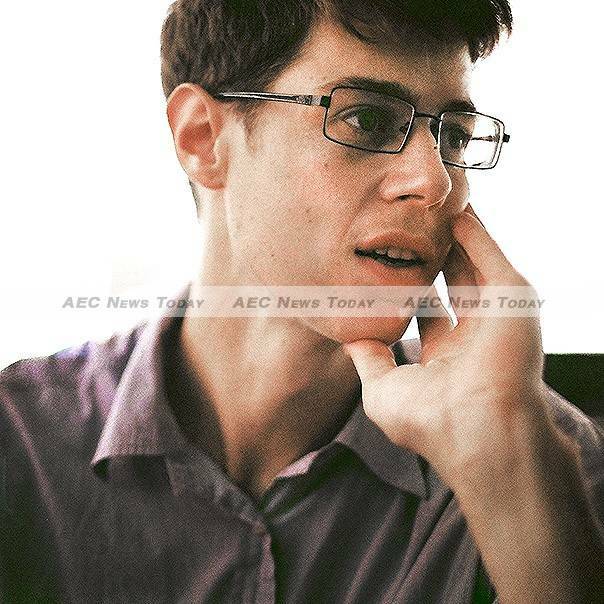 Cambodia is increasingly becoming a magnet for FDI due to the abundance of low-cost labour, rapid urbanisation, an increasing middle-class consumer market, low barriers to entry for foreign businesses, wide-spread proficiency in the English language, attractive tax incentives and import/export duty exemptions, constantly improving logistics networks, and an economy backed by the US dollar. With the solidification of Asean into the Asean Community (AC) at the end of last year, Cambodia, surrounded by strong regional economies who are increasingly outsourcing low- and mid-level skilled manufacturing operations to the kingdom, is well located. These new industrial opportunities are reducing the Cambodian economy’s reliance on the garment industry, and offering low-wage workers more opportunities for career and skills growth. Cambodians are also entering the global community en masse through technology, as a result of the rapid increase in high-quality internet penetration throughout the population. 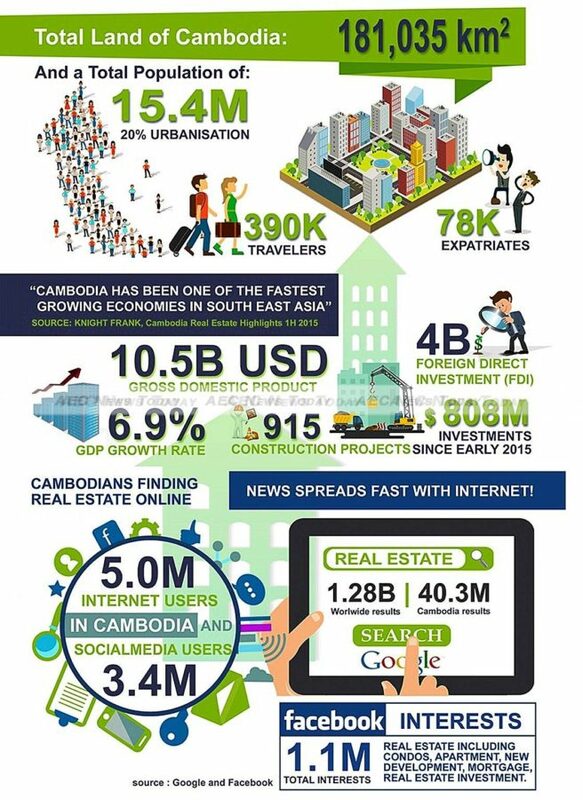 In 2015 Cambodia had more than five million internet users: one third of the population. Since 2010, foreigners have also been allowed to own apartments and condominium units in Cambodia, but not land, or, accordingly, the first floor of buildings. While foreign ownership of land is still unconstitutional, land can be easily held by foreigners on long leases that are renewable, through majority locally owned companies incorporated in Cambodia. These structures are arguably safer than comparative legal schemes in other Southeast Asian states in which foreign land ownership is formally prohibited. 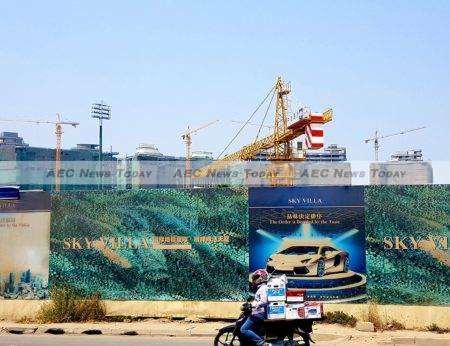 Located at the confluence of the Mekong, Tonle Bassac and Tonle Sap rivers, Phnom Penh’s high economic growth rates in recent years have triggered a real-estate boom. Construction is taking place across the city almost everywhere you look. Here, a plethora of new hotels, restaurants, bars and high-rise residential and commercial buildings are springing up in an attempt to meet demand, while industrial zones at the edge of the city continue to expand. 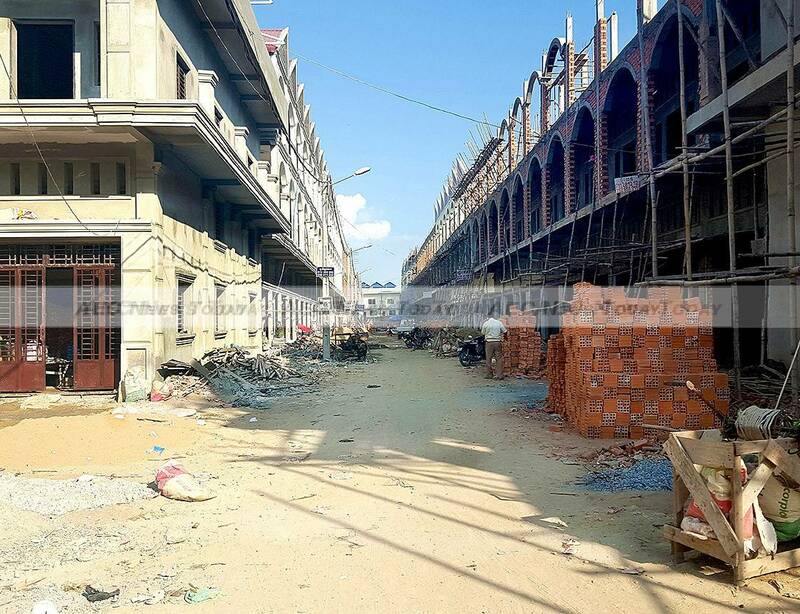 Among the evidence of Cambodia’s rapidly rising middle class is the growing number of boreys (gated residential community developments with self-serving infrastructure) across Phnom Penh. Offering various housing types and styles, these are extremely popular with local buyers, with most being sold off-plan. The Phnom Penh Master Plan 2035, scheduled to be completed by the government later this year, seeks to dictate urban planning for expansion of the city and construction of new infrastructure to accommodate the growing population. Until now, the city has had neither zoning regulations nor identifiable urban-development planning. Flats located in central Phnom Penh cost around $3,000 per sq m (10.76 sq ft), as averaged across prime residential areas, while rents range from $9 to $14 per sq m / month, depending on location and quality. Villas are generally more expensive than flats, at around $3,500 to $4,500 per sq m, while rental prices for Phnom Penh villas typically range from $6 to $27 per sq m.
Low- to middle-range apartment developments, targeting the local market, average $200 to $500 a month rental per unit in the central areas of Phnom Penh City, while the high-end, serviced and luxury condo market is priced considerably higher than this, though prices vary greatly across developments depending on scale, location and quality. Beoung Keng Kang, Chamkarmon, represents the highest-priced district in Phnom Penh with land reaching $6,000 per sq m in some parts. Previously home villas were a popular option for families wishing to live in Chamkarmon, however many of these villas have now either been demolished and the land sold for development, or converted into boutique hotels or restaurants. 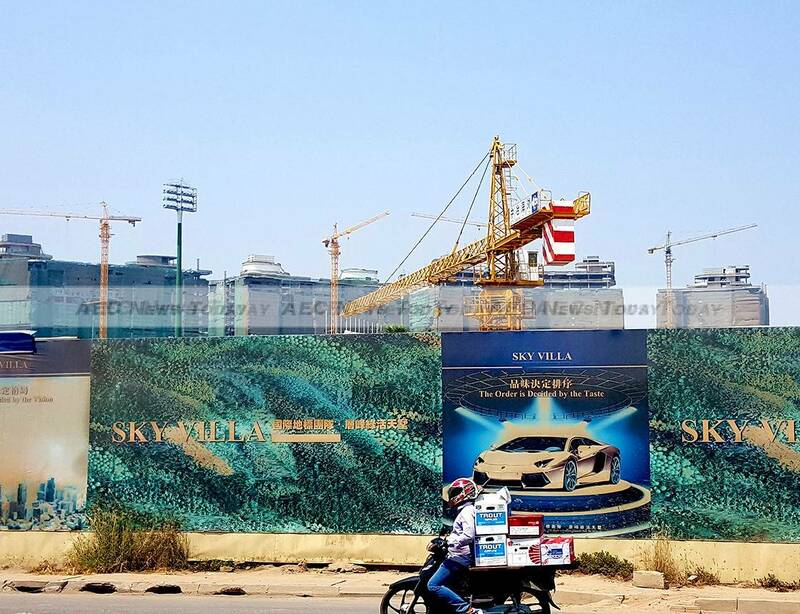 High-end condo developments and hotels are changing the area dramatically at present, and growing congestion and a lack of parking in and around Phnom Penh city centre is causing problems for inner-city residents. Other upcoming Phnom Penh residential property areas are in the west and south of the city. The peninsular of Chroy Changvar is also undergoing huge development by foreign and local developers and here height restrictions on new buildings are largely unlimited. These locations are very close to central Phnom Penh, yet land prices remain considerably lower. Prime and mid-level office space across Phnom Penh is rising dramatically, with numerous new high-rise projects being released into the market or slated for completion in the coming years, often at the cost of knocking down quaint, older villas, flats and other real estate. Grade B and C are proving the most popular, because Grade A office space is beyond the budget of most local firms. Phnom Penh commercial property options are set to boom in the future, especially with the rise of Asean and the Asean Economic Community (AEC). Whether more high-quality office and residential space is feeding the growth of high-quality shopping centres and malls or it’s the other way around is moot. But this sector of the Cambodian property market is also seeing rapid growth. Cambodia’s first international-standard shopping centre, Aeon Mall, opened its doors in June 2014 and has since experienced high demand for store space from international and local retailers. 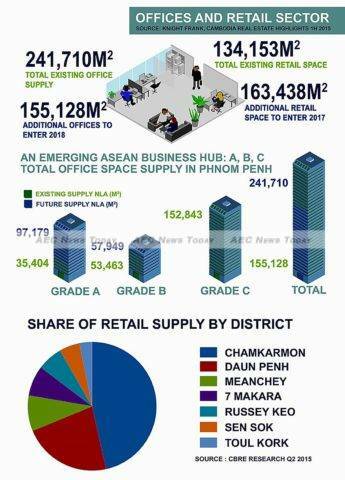 A new breed of international franchisers, who have for many years ignored the Cambodian market, see the attractiveness of occupying slots in Aeon Mall because it reflects international standards of retail space and retail-space management. The mall has convinced some of these franchises that opportunities exist and that these are viable spaces for them to locate their brand. Parkson Mall on Russian Boulevard, currently under construction, will be the next of its kind to open in Phnom Penh, while Aeon 2 is also in the pipeline. TK Avenue is another well-known, established, modern shopping plaza and cinema complex located in Toul Kork. The Phnom Penh condominium market also continues to expand, with early investors in centrally located developments enjoying appreciation of up to 30 per cent from off-plan purchases. High-end condominium development looks set to continue in prime residential locations, with developers also looking to offer luxury projects outside traditional residential districts. While the condo market was originally dominated by foreign investors, Khmer buyers are beginning to demand condos, predominantly for investment purposes and rental returns. This has led to a trend of local developers offering lower-range condo development projects to the market. Such developments range between $30,000 and $60,000 per unit off-plan, and are being bought primarily by local buyers. Domestic demand is a key element of a successful condominium project for any Cambodian property market developer due to foreign ownership of an individual building (strata law) being restricted to 70 per cent. Another trend we expect to see more of in 2016 is mixed-development complexes, including condo, office space and retail. Developers are aware of a potential oversupply in the pure-condo market in 2018/19 and are thus hedging their bets. 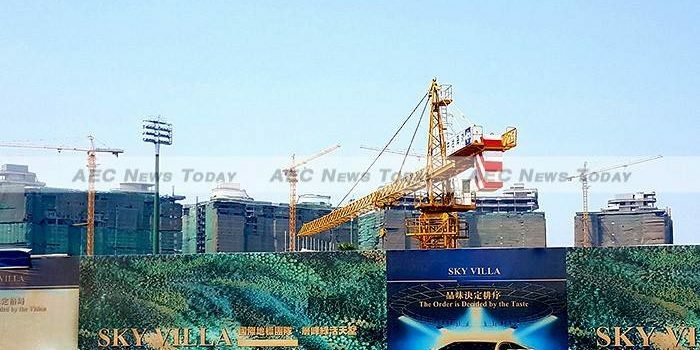 Investment from Singaporean, Japanese, Korean, Hong Kong and Chinese residents continues to grow, with the comparatively high yield guaranteed by many developers still attracting overseas purchasers who see positive chances for appreciation in the Cambodian property market compared to their slowing markets at home. Thus far developers in the Cambodian property market have focused on the high end and, to some extent, the upper-middle class, because these two represent the lowest-hanging fruit. However, a large demand also exists for quality, affordable housing in Cambodia suited to the needs of the lower-middle class and lowest-income earners, especially in expanding urban centres. With no proposed government intervention in the market, this appears to offer a great opportunity to developers able to cater to this large demographic of the Cambodian property market. With property prices in Phnom Penh continuing to push upwards, many smaller investors are being priced out. For such investors, Sihanoukville stands out as an exciting destination worth serious consideration. Home to Cambodia’s only deep-water port, Sihanoukville is the capital of the province of the same name and home to a fast-growing population of about 300,000. Many of Sihanoukville’s residents are there for the port or its associated export-focused manufacturing. The city is Cambodia’s second-largest manufacturing base after Phnom Penh, with most of its output consisting of garments and shoes. The government plans to transform this area into a Special Economic Zone (SEZ) and is currently dredging the port to support larger cargo vessels. Large reserves of oil off the coast of Sihanoukville have also been explored and plans are being made for extraction in the coming years. Our research shows that in 2015 the average year-on-year property growth in Sihanoukville was between 15 and 25 per cent for land in the city centre, while for land along the seaside road and main commercial roads, prices rose by 40 to 50 per cent compared to those in 2013-14. Sihanoukville offers opportunities for cheap land to be developed into resorts, offices, guest houses, hotels or apartments. As investment capital continues to flow into the region, in particular from the Chinese, Sihanoukville is also experiencing the beginning of a high-end condominium market with various grand-scale projects already underway.